2.22% of tumours harboured pathogenic CHEK2germline mutations. TP53 pathogenic germline mutations were found in 0.82% of the tumours. 值得注意的是： All reads with a mapping quality < 70 were removed prior to calling. Based on our analysis of replicates, SNVs with MuTect quality scores <6.95 were removed. SNVs present at VAFs smaller than 0.1 or at loci covered by fewer than 10 reads were removed, unless they were also present and confirmed somatic in the Catalogue of Somatic Mutations in Cancer (COSMIC). We used the normal samples in our data set (normal pool) to control for both sequencing noise and germline variants, and removed any SNV observed in the normal pool (at a VAF of at least 0.1). The mutation patterns of some Mut-driver genes differed by ER status. Overall, 22.6% of tumours harboured a coding mutation in one of the seven Mut-driver genes involved in chromatin function (KMT2C, ARID1A, NCOR1, CTCF, KDM6A, PRBM1 and TBL1XR1). 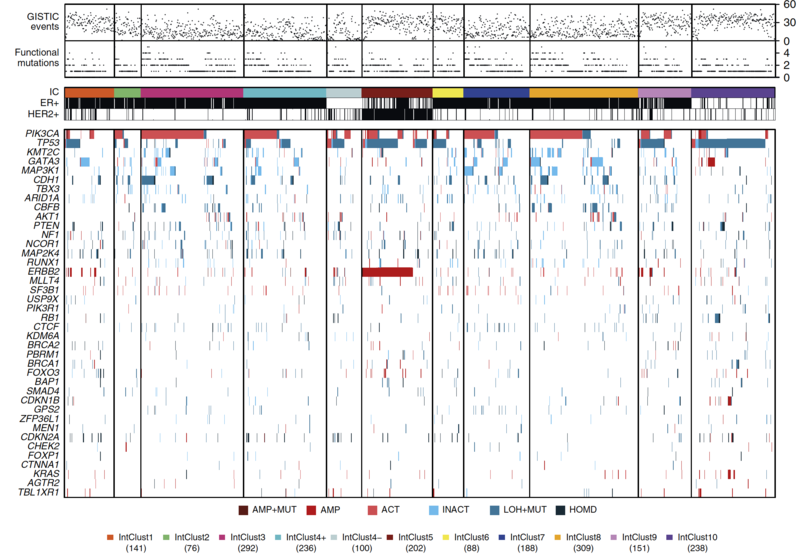 Of the 40 genes, 8 were independently identified as Mut-driver tumour suppressor genes using the ratiometric method described above: FOXO3, CTNNA1, FOXP1, MEN1, CHEK2 in ER+ tumours; CDKN2A, KDM6A and MLLT4 in both ER+ and ER− tumours. ER+ tumours generally had lower MATH scores (median=0.29, IQR=0.18–0.44) than ER− tumours (median=0.41, IQR=0.25–0.56).